A New and Accurate Map of England and Wales, from the latest Surveys. 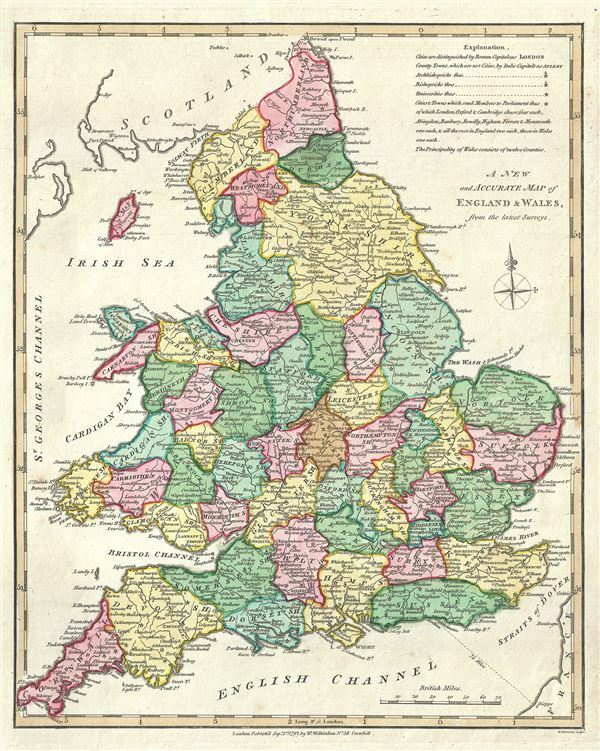 This is a beautiful 1793 map of England and Wales by Robert Wilkinson. Wilkinson's map covers England in full from Scotland south to the English Channel and from St. George's Channel to the mouth of the Thames River. Color coding divides the region into various shires and counties with roads, cities, and rivers noted. A key appears in the upper right quadrant. This map was engraved by Thomas Conder and issued as plate no. 10 in the 1792 edition of Robert Wilkinson's General Atlas.